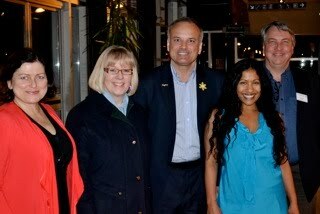 Mayor Richard Stewart & Councillor Reimer supporting Theatre in Coquitlam – Opening Night Evergreen Cultural Centre. Thanks to David Mann (far right) the man responsible for inviting us to his wonderful theatre. 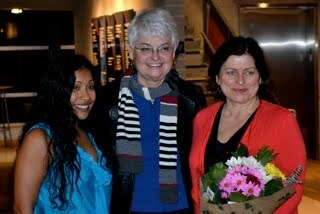 Sarah Hayward, MLA Diane Throne, and Veenesh Dubois . The Opening night of our Double Bill was well received. Kim and Miranda brought me lovely boquet. Thanks to all who attended. Awesome, Sarah! Congrats on your opening! I will be there Friday night.